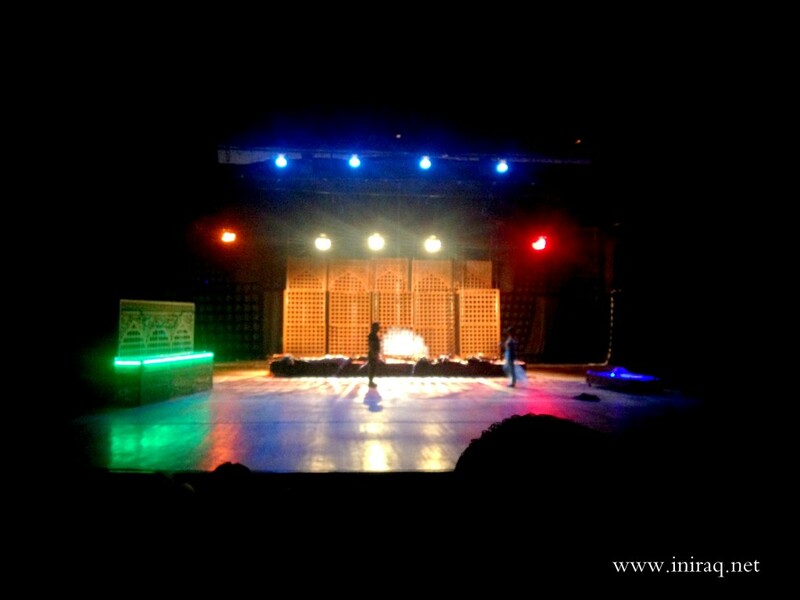 6th of April, at the Monday, the performance by modern play «Minisima» went off in Baghdad State theater. Casting – Ahmad Monika, Ali Nadjimaddin, Hanad Nazar. Director – Munadal Dawood. 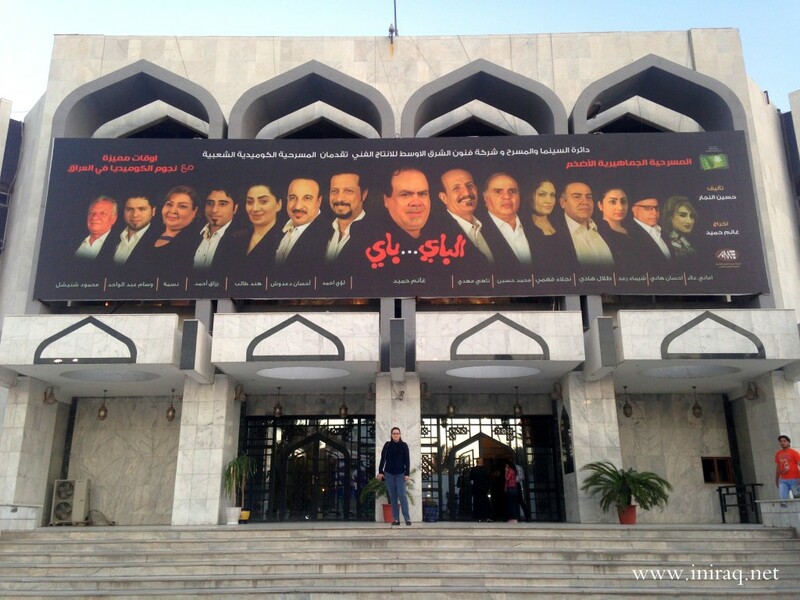 The State theater of Baghdad is situated in Karrada district, right opposite of sculpture «The Lamp of Aladdin». At the entrance is check-point, of course, so no worries about safety. The building is quite big, with a front door, a murmur floor, a high ceiling and massive glassy chandeliers. There is a hall at the first floor with П-shape. The photos of performances are hanging on the walls. In the center of hall is a small cafeteria where you can drink some coffee or tea with snacks. In the beginning of the hall is playbill and stands with advertisements. By the way, that day here was a poster of some independent theater studio, which will present their performance at the state stage soon. So, there is even independent studio in Baghdad. 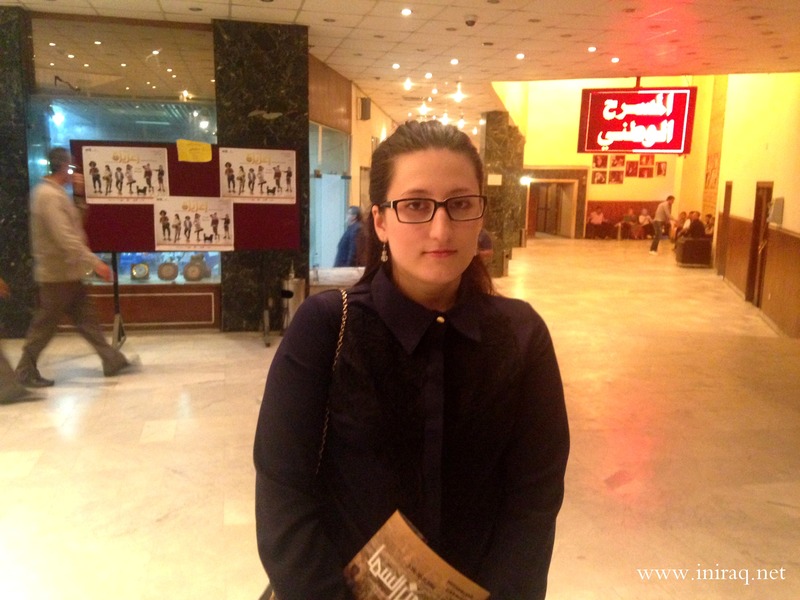 – Perhaps, it’s a quit hard to be an actress in Iraq today. – For sure, to be an actress means to be threatened by men, to be under people’s disrespect like common woman. – Yes, its kind of truth. All this created by Saddam Hussein. He turned the art a bordel. For having a possibility to work as an actress, dancer or singer they should get a sponsor of him or someone from his environment, to become a fancy woman. That’s why only women who could sale themselves stayed in Iraqi Art and people was in the habit of seeing women in art as a women for sale, even if now it’s absolutely another situation. No dress code, cocktail dresses or something like that. People smoke in hall, although merchant urged to adequately insure to smoke only in cafeteria. And if in Iraq all smoke inside, from ministries to hospitals, here they smoke much more then everywhere. Most of the visitors are cultural workers – you can recognize the journalists, actors and actresses etc. Guys with long hair, with artistic hats on the heads and with cigarette in the mouth, girls in scuzzy jeans, short dresses and with tattoos on the legs or hands (and also with cigarettes) this is a bohemia that get together here, in the State Theater. You can see that many of the them know each other and talk. And all this convey the impression of «theater for theater», that is the place for bohemia, not for general public, who come to touch the art in the blow of their workdays. At the noisy streets you never meet this longhair boys and a saucy bits so when you meet them a lot in one place it rivet your attention. And this getting you sad because in metropolitan theater exactly that things occupy your mind. Auditorium has a one floor – there is no balconies and boxes. Seats are placed quite comfortable – every row is higher than the previous. Before start they asked to turn off mobiles and wished the pleasure time. The coulisse wasn’t closed. The duration of performance was 50 minutes. Menisima is a popular candy (Gaz in English), it name translated as «from heaven» (from legend of Iraqi Jewish). 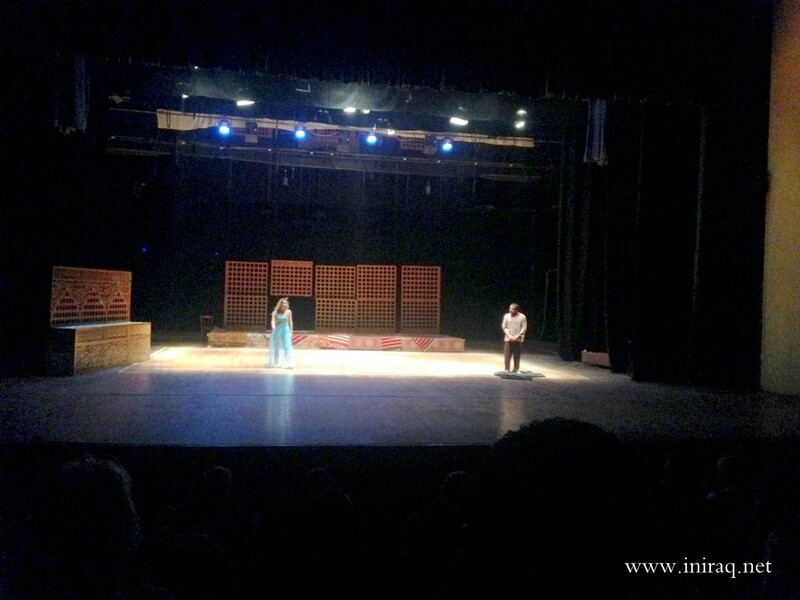 So, in the play it is symbol of homeland. The beginning was a little bit prolonged – the main character Majeed tried to pray, washed his face in small beautiful fountain, for the fist he cross himself, after that he started pray in Islamic way. The idea was to show that he doesn’t gain the understanding of it. He prayed ecstatic and long time. After that appeared the girl – young dancer Hanun, who ran away from Syria because of war. Majeed sheltered her. She is light-headed person, he is trying to be religious. Hanun ask Majeed why he doesn’t go to America where his sister lives, he answer that here is his homeland. Periodically we hear shooting as a background. She wants to leave this damned land, he is suffering and not understanding why all this happened, wants to stay and moreover he wants to go at war. After that – intermezzo with third character. They are dancing in American night club, joke about English language and American life. Majeed gone at war. The third character is appearing – Sim Sim who act like a gay, grumbling about they are under press, hugging Hanun. 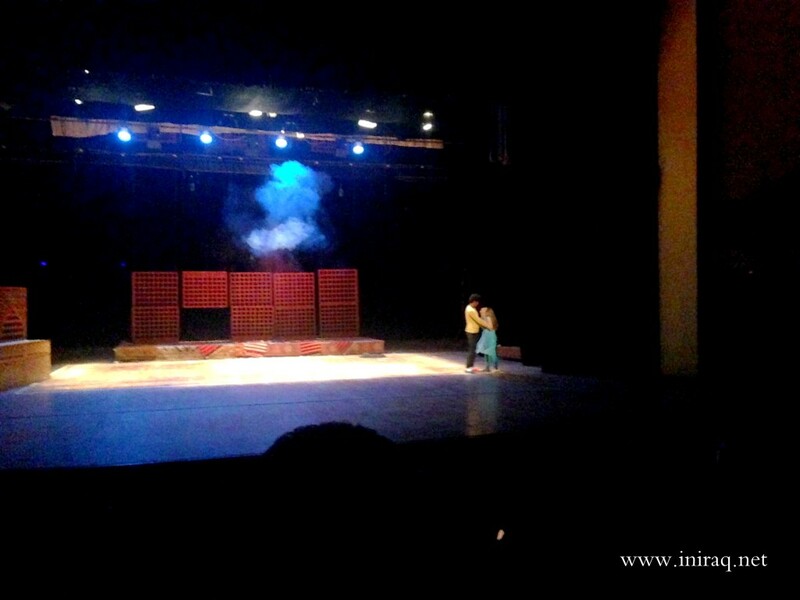 Behind the scene is occurring the murder of dancer group – Hanun and Sim Sim discuss how the people could be so cruel. The boy avow himself he is a normal man and he pretended for being close to Hanun and he loves her but she answers that she loves Madjeed. Sim Sim gone. Majeed is coming back, Hanun is yelling on him thinking he participated in murder of dancers. But he is denying it and talking about war. After that the group of soldiers are appearing and falling down with the sound of shooting. After few minutes the performance is ending all of a sudden. Soldiers are standing up and gone. Actors and behind the scene workers come, take a curtain. The end. Many things wasn’t understood – who, where, from where. Dramatic line and relationships between characters was unconstructed, wasn’t created, and inner development of conflict didn’t happened. No dramatic action . But there was artificiality and many unwarranted moves on the stage. Actors raised many important topics such a oppression of differing, the war which breaks lives, the view about America as paradise where everyone wants to run off. They says that but didn’t play. 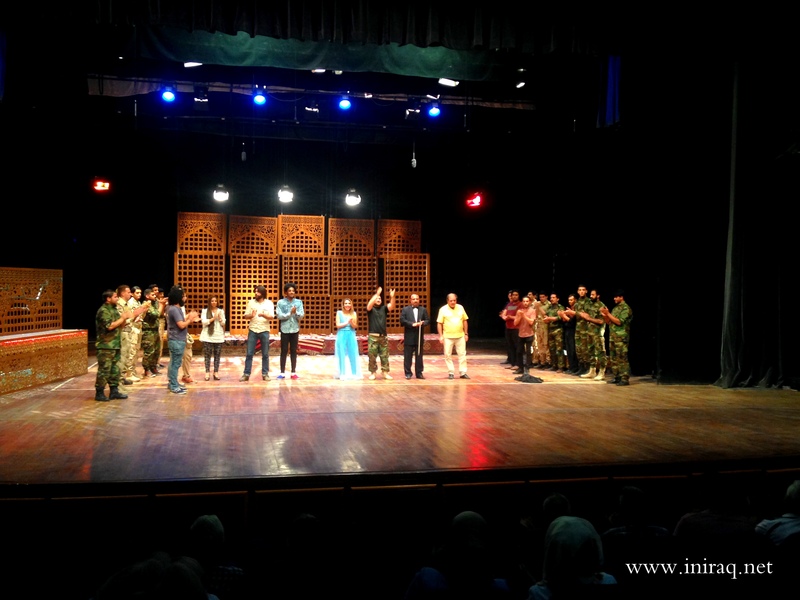 Iraqi culture and traditions didn’t give birth theater like it was in Europe, so this kind of Art is strange in all Arabic world. So, we should remember that before judging it. Also it should be noted its very good there is occurs something in Baghdad in this sphere, there is young, spirited people, which eager in Art. And one day Iraq will resurge again, like in past century, because there is eagle on the Iraqi Emblem that looks like Phoenix bird, and it definitely means something.